When you add spice to a recipe, you’re not just making it taste better, you’re also making it better for you. Gram for gram, spices are some of the most nutrient-dense foods available. Made from bark, seeds, fruits, and roots (leaves and flowers are classified as herbs), spices are dried, a process that concentrates the nutritional properties of the plants, giving them superpowers to enhance the immune system, ease digestion, boost metabolism, balance hormones, and combat disease, all while making food taste great. Although it’s often thought to be a blend of spices, allspice is actually a berry native to the Caribbean and South America, where it’s used in curries and jerk seasonings. Researchers have noted its ability to relieve indigestion and improve blood sugar levels. It also has strong anti-inflammatory and antioxidant properties and is a source of calcium, vitamin C, iron, and magnesium. Capsaicin, the compound that gives chiles their heat, is a metabolism-boosting calorie burner. Cayenne is also a source of cancer-fighting, heart-protecting antioxidants, and has been shown to relieve minor pain associated with rheumatoid arthritis and muscle sprains and strains. Your favorite toast and oatmeal topping may help regulate blood sugar and improve insulin sensitivity. It’s also used for reducing inflammation and is a source of antioxidants. Taste for yourself in our Vegan Chocolate Horchata. The seeds of the cilantro plant contain antibacterial and anti-inflammatory properties. Emerging research suggests it may relieve anxiety and depression, as well as improve memory and cognition. From Mexico to the Middle East, cumin is used to season everything from mole to hummus. It’s also correlated with reducing cholesterol and triglycerides, good news for your heart. Not so great for your breath, but good news for your heart, garlic may help reduce bad cholesterol and the risk of heart disease. It’s also noted for its antimicrobial and antiviral properties, which repel bad bacterial bugs and keep harmful viral strains at bay. A naturopathic favorite, ginger has been used to treat arthritis, asthma, pain, inflammation, and upset stomachs for thousands of years. There is now plenty of evidence to support ginger’s digestion-calming effects, which has lead to its use for relief from morning sickness and nausea related to postsurgical procedures, chemotherapy, and motion sickness. 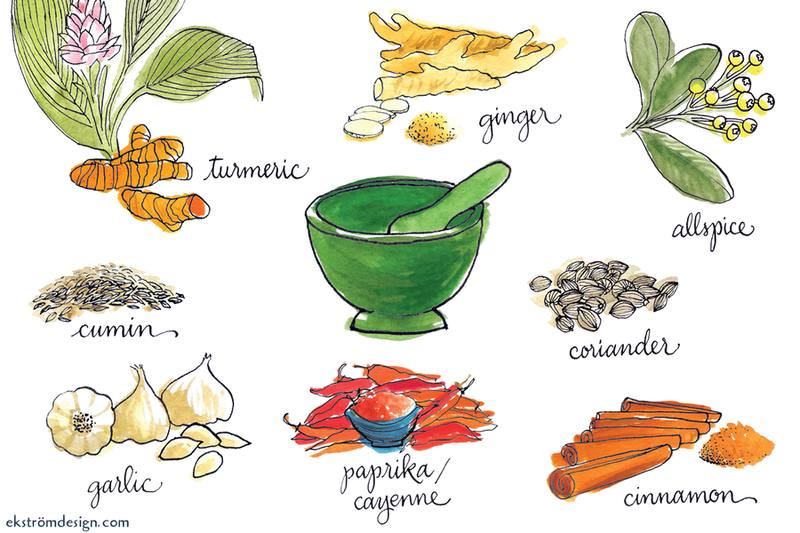 Bright colors and bold flavors equal big nutrient value, and turmeric is a prime example. Curcumin, an active compound in this golden spice, boasts a trifecta of anti-inflammatory, antioxidant, and anticancer properties. In fact, researchers have correlated turmeric with improvements in blood sugar control and diabetes, as well as a reduction in cholesterol and cancer growth. Pro tip: always pair turmeric with black pepper (like in our favorite turmeric ginger tonic) to increase its absorption and optimize its impact.